One difficulty associated with being on the interwebs at all times is that I often can’t recall where I found a recommendation. My browsing process goes like this: click on a shiny link!, read about book, decide it is for me, go straight to library website, place hold… perhaps leave a comment? But most likely just close out the window/tab, and go on to the next blog post. Related note: I need to keep better track of the reviews that inspire me to click – and eventually read – books! Credit *must* be given. I don’t know where I heard about Emily Lloyd-Jones’ debut Illusive, but I do know that YA sci-fi + organized crime + superhero capabilities ticked several of my favorite boxes. I picked it up from the library and read it straightaway (well, almost straightaway… $1.40 in fines is pretty much immediate in my world!). If the idea of a cross between Holly Black’s Curse Workers series and X-Men sounds #awesome, then this is the book for you. If you want gray areas in motivations, secrets that could break apart groups (and agencies! ), and crime from the insider’s perspective, you’re golden. That said, as soon as I put the book down, I started considering the setting (can we call it worldbuilding if it’s sci-fi? ), and I noticed a couple of gaping holes. It was one of those, “I liked the book so much! But… now that I think about it…” experiences. Hate that! But let me tell you my quibbles (perhaps they will be insignificant to you!). First, twenty years in the future was not that futuristic. Cellphones, internet, cars, computers, GPS – they all functioned in the exact same way they do today. Which, I get: write what you know (present day). But this is supposedly the future, and I am (apparently) picky about sci-fi. Update those little details that give sci-fi an extra boost of imagination, okay? Okay. Second (somewhat related to the previous point), the mechanics of identifying the inoculated and immune tested population… were so basic! Plot point: people have to carry around physical identity tags, and if they don’t, they can get hauled away. Identity TAGS. No instant blood testing, retina scanning, facial recognition, chipping… nope. This is a world where counterfeit = easy, because there aren’t even hologram drivers licenses. I call foul. Even if you take a hit population-wise, I don’t think the tech side of things would regress that much/unevenly. Or at least explain why it has! Other annoyances: the set-up is slow and confusing, so even though action is moving right along, Ciere’s world doesn’t come into focus until several chapters in. This might tempt other, less-patient readers to put the book down. Also, this story is just full of dudes. Ciere is the main voice, yes, but she’s the only female with any significant part in the story. That bummed me out, because the book did so well otherwise in the diversity stakes. YES, I’m here to tell you something good instead of complaining anymore! Diverse characters! Front and center. And (I’m pretty sure? It’s not explicit, but I assume?) gay representation as well. Also, though Ciere is the main character, you also see things from the viewpoint of Daniel, one of her crew, now forced to work for the other side (gasp!). The dual viewpoints enhance the plot (100% more twists!) and character development, as each operation is ‘visible’ from both sides. Concluding thoughts? 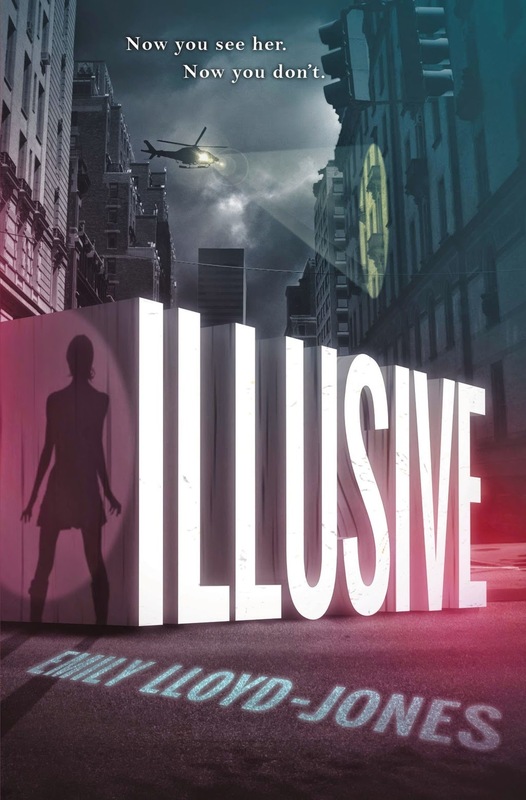 Illusive was a fun-but-flawed take on superpowers, survival, and honor (or lack thereof) among criminals. If nothing else, I liked it because I like intelligent cons. Even though I wasn’t completely satisfied by the final product, I want more. I will read the next book just to see what Lloyd-Jones does with all of those loose ends. Recommended for: fans of young adult sci-fi (light on the sci-fi elements) and superhero stories, and anyone who liked Holly Black’s White Cat. Ooh, fun! I bet my love would enjoy this!